Taking information about Naples landmarks is an excellent way to visit the major attractions of the city without getting tired and with a well-planned itinerary. Even if you can join some tours that make you visit the historic centre in about 3 hours, knowing the main monuments, squares and spots where you can admire the panorama of Neapolitan gulf in advantagecan make you do your own plan: the perfect itinerary that best suits your needs and allows you to do everything taking your time. A good route to get to know quickly but thoroughly the historic centre of Naples includes Spaccanapoli or via deiTribunali. From Spaccanapoli you can go to piazza san Domenico and the in piazza del Gesù, where you can admire the monumental San Domenico church; the Gesù Nuovo church and the Santa Chiara monastery. All these monuments are Naples landmarks. From via deiTribunali you can get to Piazza Bellini and then to Port’Alba, one of the ancient doors of the city. Not far from Port’Alba is Piazza Dante. From piazza Dante you can continue your walk through via Toledo and reach the famous piazza Plebiscito. Next to piazza Plebiscito are the San Carlo theatre, the Royal Palace and via Caracciolo, another great landmark of Naples as it is the only road next to the sea. Walking on via Caracciolo you can visit twocastles of Naples: the MaschioAngioino and The New Castle. Other Naples landmarks are Mergellina and Posillipo areas. You can reach Mergellina by bus, by the underground or along the city’s waterfront. To go to Posillipo, it is better take a bus and get off where you prefer to enjoy the many scenic spots that you can find there. Naples is rich of landmarks to considerate such as the galleries. The galleries are monumental structures made with iron and glass. 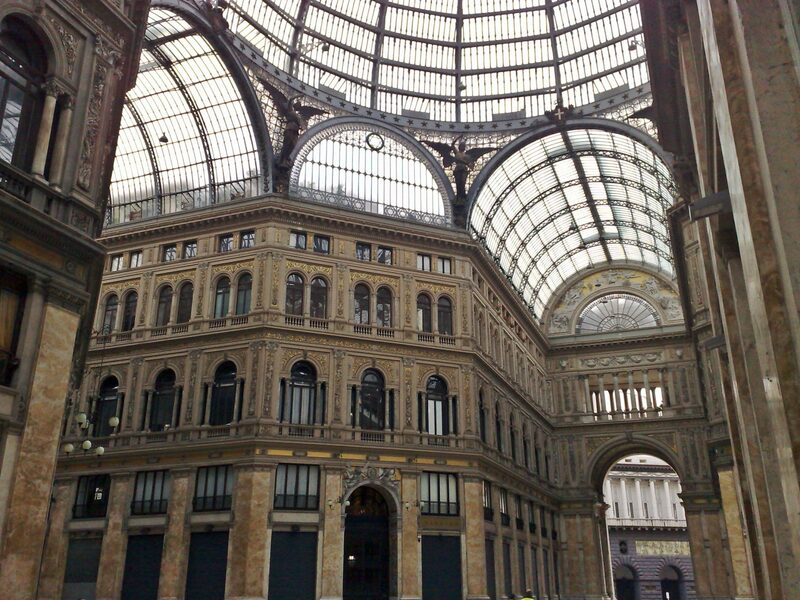 In Naples there are two galleries: The Principe one and the Umberto I one. The Principe gallery is near the Academy of Fine Arts, the Bellini theatre and the National Archaeological Museum. The second one has entrances from via Toledo, near piazza Municipio and in front of the famous San Carlo theatre. In addition to the Naples landmarks, it is important to consider that Naples itself is a reference point for tours and excursions in the surroundings. From the main station you can go to Pompeii and Herculaneum ruins or to Sorrento coast. From the port in Piazza Municipio, you can get to Capri, Ischia and Procida.